External graphics card docking stations that level up your laptop’s visual prowess are the new black, it seems. While you’ve long been able to jury-rig an external GPU setup to game on game-less notebooks by tapping into a desktop graphics card's power, commercial solutions are finally starting to gain traction. It all started with Alienware’s Graphics Card Amplifier, which let you turbocharge Alienware laptops with Titan X power. The MSI GS30 Shadow’s claim to fame was a bespoke docking station. Now, at CES 2016, Asus is unveiling its own ROG XG Station 2—the follow-up to an external graphics solution first unveiled in 2007. Asus’ press release doesn’t reveal much detail about the rig, other than that it exists and utilizes “a custom interface that lets notebooks harness the power of desktop graphics cards to significantly boost gaming performance.” The Alienware Graphics Amplifier and MSI GS30 Shadow each lean on a custom PCI Express connection to allow the docks to communicate with laptops; the ROG XG Station 2, which was “specifically designed for Asus laptops and graphics cards” but works with other graphics cards as well, uses PCI-E x4 over a pair of Thunderbolt 3.0/USB Type-C connections. As you can see in the images above, the ROG XG Station 2 takes style cues from Asus’ ROG Gr8 small-form-factor desktops. 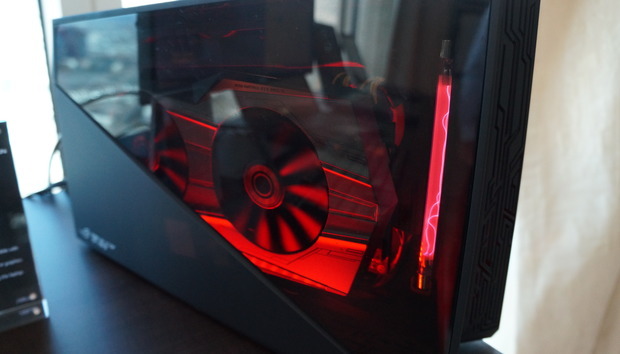 The docking station will charge your laptop while you’re using it, which is actually the reason why the ROG XG Station 2 uses a pair of USB-C connections; it could deliver gameplay alone over a single cable, but Asus decided it was worthwhile to use a pair of connections to provide gameplay and charging capabilities. You’ll even be able to unplug it while your laptop’s still running in an interesting feat of technical wizardry. And don't worry about gameplay being nerfed simply because you're using an external solution over PCI-E x4. Asus says that there is indeed a slight performance hit compared to slotting a graphics card into a full PCI-E x16 slot in a desktop tower, but only to the tune of 1 to 5 percent, depending on the situation. Editor's note: This article originally published on January 5, but has been updated with additional information after meeting with Asus.